The gently curved contour of the body makes the form generous and beautiful while the pitch-black makuyû glaze flowing down like a veil is lustrous. 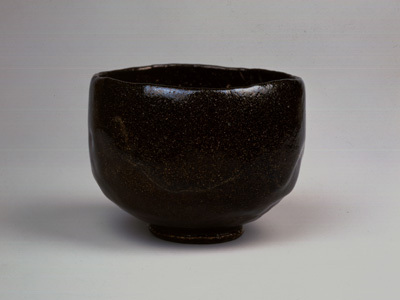 It is representative of Dônyû's black tea bowl with this type of glaze texture. A shikishi paper like design is applied in white slip on the red juraku clay body coated with a transparent glaze. Decorativeness is further more pursued in Dônyû's work compared with the two preceding generations. 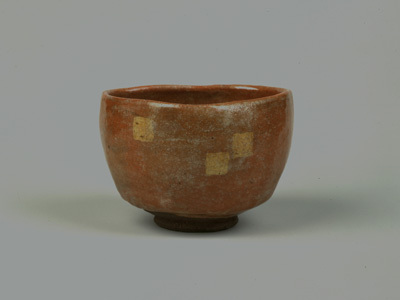 The glazing technique on this piece derives from Chinese sancai wares. 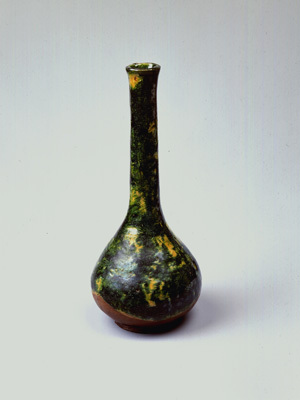 This flower vase with a fine balance between the slender long neck and the bulgy body is vividly glazed in green. It is representative of Dônyû's innovative style.